In 2013 I discovered the power of juicing. Call me a late bloomer, but the reality is, I was always skeptical about this trend. Before I made the leap, I researched local Miami juice cleanse options in order to understand the best way to detox and cleanse safely. I know how my body works, and once I’m off the cleanse I’ll go back to eating cookies (#sorynotsorry), so for me detoxing was more about giving my body a rest and loading up with natural vitamins. Armed with the right information I decided to give juicing a whirl. For me, a juice cleanse packed with fresh organic fruits and veggies was a must, so the Master Cleanse and Blue Print was out. It was also important that I used local juicers because freshness meant – no time for shipping. Since I started this mini-detox adventure I’ve used a few local juicers. Here are my top 3 local companies that offer the best 3-day cleanses. This juice spot is still one of my favorites in Miami. I love their yummy salads and waffles and when I was looking to kick start my detox Ten Fruits was a great resource. Alex and David are passionate about a healthy lifestyle so they made it easy to transition from solid foods to juices. My favorite cleanse is the Cleanse Professional. I love that they integrate smoothies like the Super Green Smoothie into this cleanse. For a beginner – it was perfect. 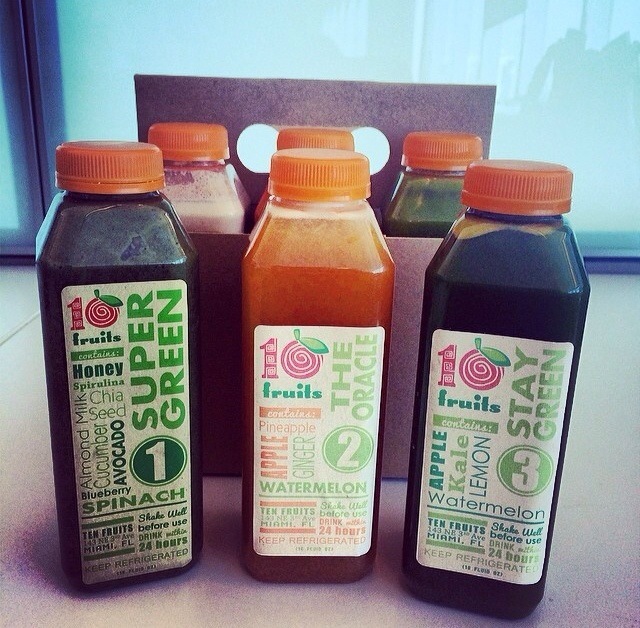 My favorite juice from the Ten Fruits cleanse is their Refreshing Cleanse – it’s so, well, refreshing! After the cleanse I noticed my skin looked amazing and I had more energy than ever. I guess this is why people get addicted to juicing? Ten Fruits also offers healthy food options so you can brunch with friends without the guilt! A co-worker and mutually bonded over our love of healthy snacks and pastries – random right. While on my 3 Day cleanse she too was inspired to try it out – after all – my skin looked amazing. She researched local juice companies and discovered My Raw Juice. The best part – they DELIVER! Woop. 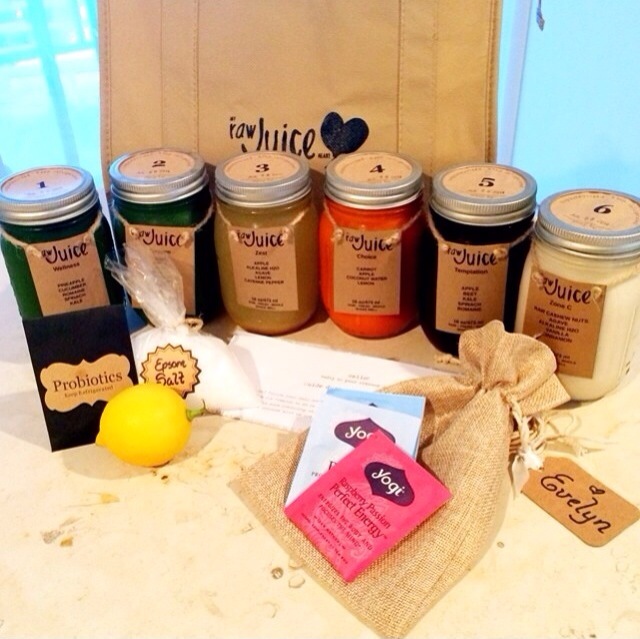 The juices come in the cutest packaging – mason Jars and a reusable insulated tote. My favorite juice from My Raw Juice is the cashew milk. It’s the last juice of the day and perfect to pair with your perfect book to relax after a long day. This is probably my favorite local cleanse because of the attention to detail and personal motivation from the owner. It doesn’t get more local than that! I recently decided to try the Jugo Fresh cleanse when I was sick in bed. As most of my friends know – I can rarely sit still for 2 minutes – so you can imagine my anxiety after a day of lounging around with messy hair, mismatched clothing, and a fever. Since my diet was mostly liquids at this point I figured a detox cleanse would help get the bug out of my system. With names like Saca Lo Todo – which literally translates to get it all out – I figured I couldn’t go wrong with this remedy. An exorcism of the Brickellista, if you will. JUGO FRESH IS NOW CLOSED – BONUS JUICE BAR COMING! Juicing is a great alternative for anyone looking to add greens and veggies to their regular diet. I prefer buying my juices pre-made, but my friends also love making their own at home. Check out these juicers which are a low cost option to make your juices at home with custom recipes.